Breakfast recipes on a Monday, oh how I missed thee. Right now, I'm probably giggling and having a cartoon-worthy wonderful time with Hayley from The Domestic Rebel, today is her last full day visiting here. Perhaps we're even having breakfast, maybe making it together. Perhaps we are making these pancakes. 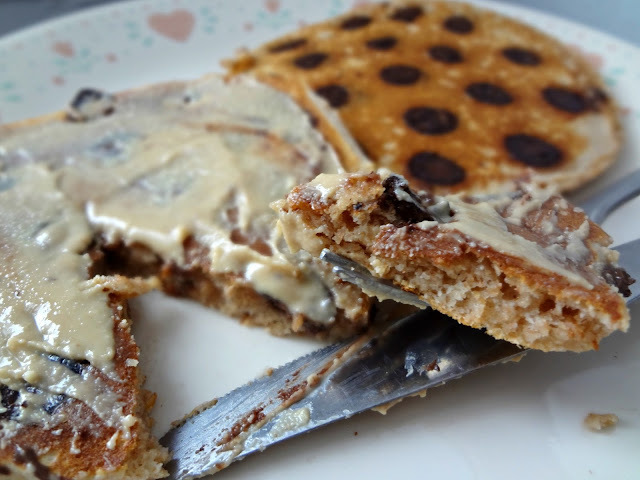 Now, if you're familiar with my pancake habits, you know that I eat chocolate chip pancakes (or waffles) with peanut butter spread on top. That is the way I like it. I also like for my breakfasts to be pretty healthy, though, and that is where a recipe like this comes in. These pancakes are made entirely with whole wheat flour and they are fluffy and fabulous. 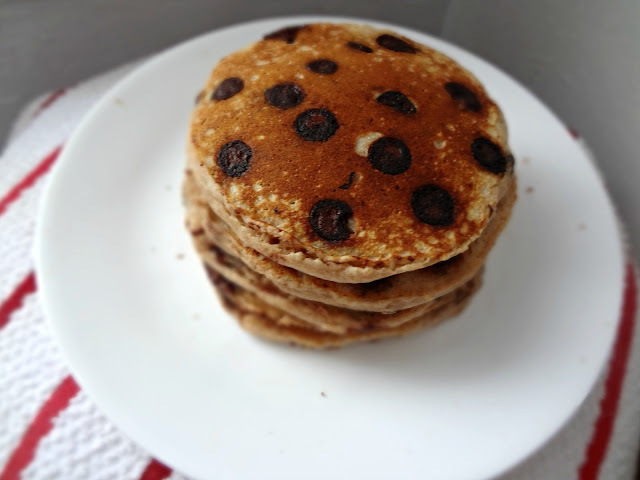 You don't even have to put chocolate chips in em if you want, you could pull a Michael and chop up some apples and throw those in these with a little cinnamon. Really it's up to you. 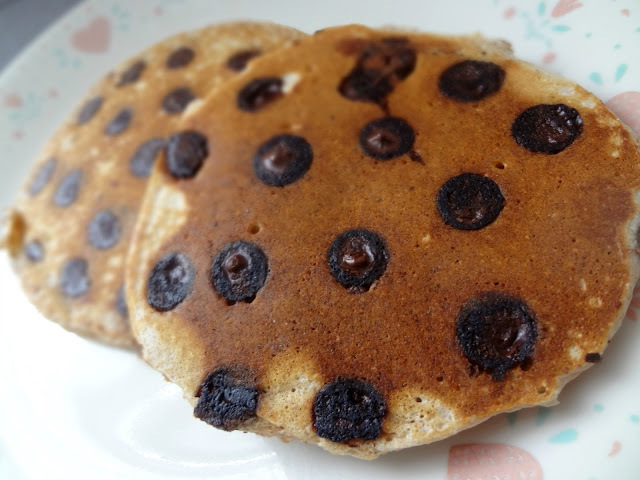 I just like the chocolate chips. 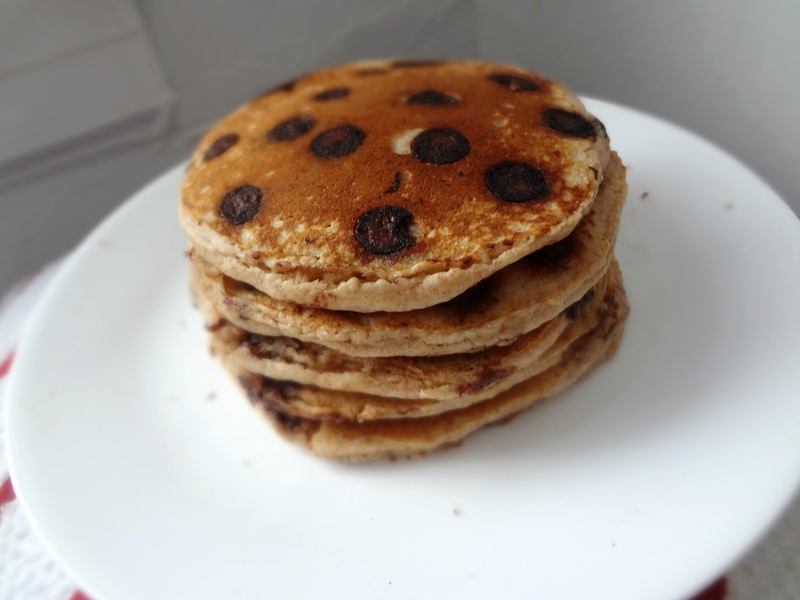 The first time I attempted to make these pancakes it was a bit of a disaster. After making the entire batch, Michael complained about them tasting funny, to which I replied that there was nothing particularly weird in these. Then he went to have a drink of milk-and it was apparently very bad. The same milk I had just used to make these pancakes. So...into the trash they all went. And I was stuck starving, with a sink full of dishes, and no food. I was a sad Kayle. The second venture into these pancakes went much better, although I was sort of gun shy this go round, made paranoid by my previous traumatic experience. I worried for naught. These tasted delicious. Fluffy, yet hearty, and full of chocolatey goodness. Then, I was a happy Kayle. Whisk together flour, sugar, baking powder, baking soda, and salt. Spray a skillet or griddle with non-stick cooking spray and heat up. 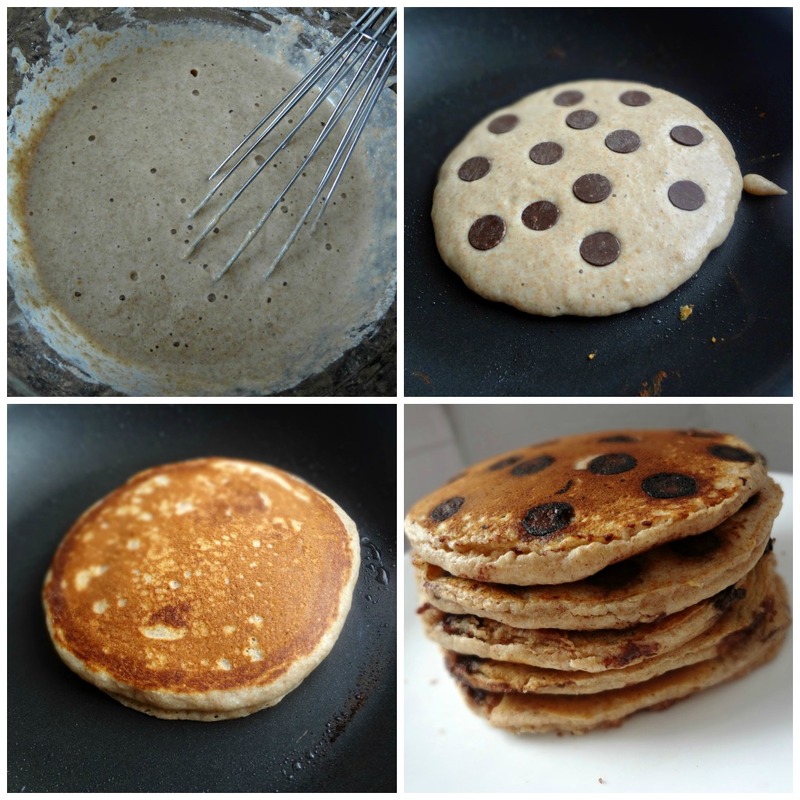 Scoop batter onto the heated surface, spread into a circle, and position chocolate chips, etc. on top. Cook on medium low heat for a couple minutes until bubbles form towards the center and the edges begin to raise up from the pan. Flip and cook the other side to a golden brown. Adjust the heat and cook times as needed. Serve hot with peanut butter, butter, syrup, etc. !